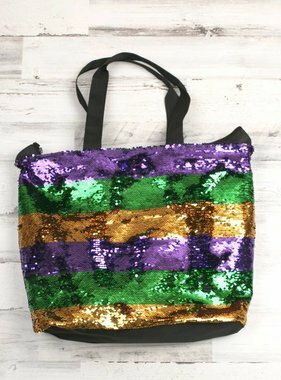 Magic sequin fanny pack in Mardi Gras colors is the perfect accessory for the season! Pack measures 9 inches by 6 inches. One side is purple and turns green with a swipe of the hand, while the other side is green and turns gold. One zipper pocket. Reversible with adjustable waist strap.